The Olympus US Open Series returns for a sixth summer season, once again featuring the biggest names in the game. It’s a summer of love for tennis fans with the return of the Olympus US Open Series, the six-week summer tennis season that links 10 North American tournaments to the US Open. Now in its sixth year, the Series showcases the top tennis players in the world as they compete for more than $30 million in a “regular season” that leads up to a season-ending championship at the US Open. Best of all, with the action beginning in July and continuing every week into mid-September, there’s lots to love all summer long. Thanks to the Olympus US Open Series Bonus Challenge, the best-performing players in the summer season stand to gain the most when they arrive at the US Open. The Olympus US Open Series awards bonus points based on performance at each stop, with the top three men’s and top three women’s finishers in position to earn bonus prize money at the US Open. For the first-place Series finishers, that means the opportunity to take home $1 million in prize money at the US Open—a feat Roger Federer accomplished in 2007 by winning both the men’s Olympus US Open Series Bonus Challenge and the US Open singles title to earn $2.4 million—the single largest payout in tennis history. Over the years, the Olympus US Open Series has served as a platform for the very best in tennis. Along with Federer, the Series’ first-place finishers have included US Open champions Kim Clijsters, Lindsay Davenport, Lleyton Hewitt, Andy Roddick and Maria Sharapova, as well as this year’s top-ranked players Rafael Nadal and Dinara Safina. The Series has also introduced a new wave of tennis talent, such as the 2006 Series women’s champion Ana Ivanovic, an up-and-comer at the time. And the only two-tournament winner on the men’s side last year was Juan Martin Del Potro, who started that summer ranked No. 64 and is now a fixture in the world’s Top 10.
no U.S. network has ever done—the new partnership with ESPN marks the first time the Series and the US Open are being carried by the same cable broadcast partner, creating a more consistent television package for the sport. The Olympus US Open Series has been the proving ground for some of the greatest innovations and enhancements in modern professional tennis, including “US Open Blue” courts and the “Chase Review” electronic line calling challenge system. 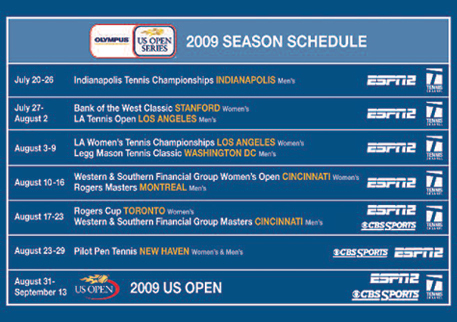 The Series has also helped introduce “Tennis GameDay” desks at select tournaments and appointment television with back-to-back men’s and women’s Sunday afternoon finals. New for this year are the addition of a women’s event in Cincinnati and an advertising campaign, “It Must Be Love,” which truly gets to the heart of the matter: that this is indeed a summer of love for tennis fans everywhere.